“Narco Tanks” (known as “Narco tanques” in Spanish) is an umbrella term made by the media for the improvised armored cars used by modern drugs cartels in Mexico. 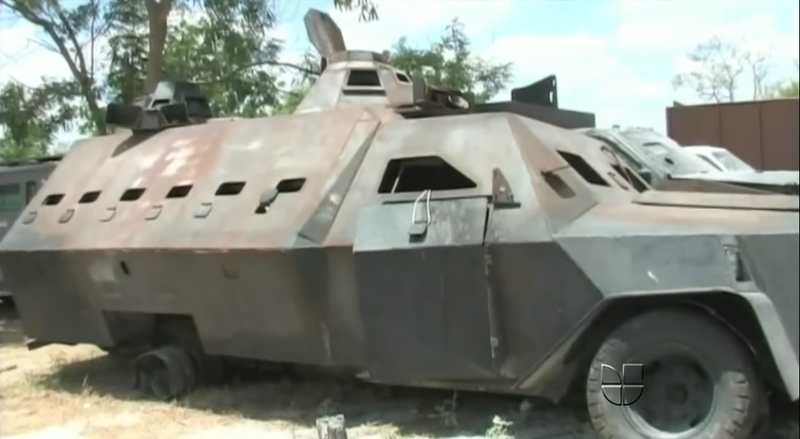 SUVs and commercial vehicles serve as the chassis for Narco Tanks, and they are tooled up with armor, turrets, mounted weapons, and even James Bond-like gadgets. They are seen mostly in the Mexican states bordering the USA because these areas have become zones of intense conflict between cartels competing for drugs smuggling routes into the USA. 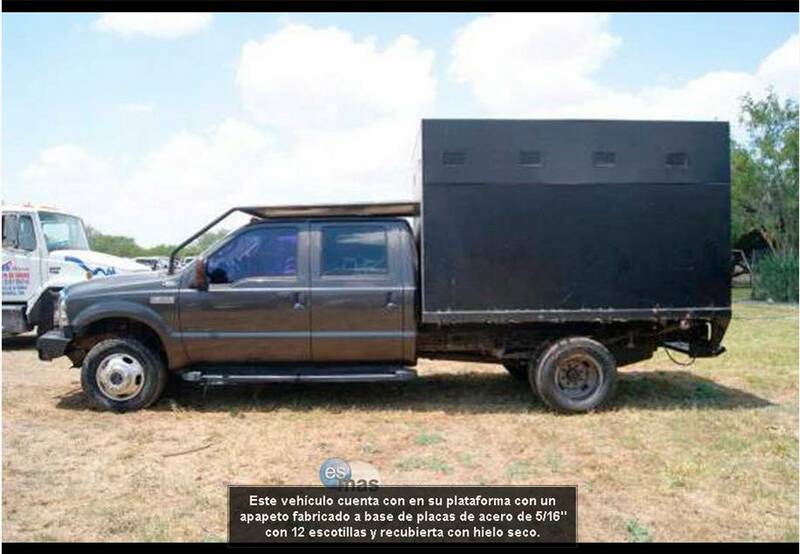 These vehicles typically look like something from the post-apocalyptic film, Mad Max, and were first reported at some point between 2010 and 2011; although the Mexican mass media is often deliberately slow to report on certain cartel-related stories for fear of reprisal attacks. Created in illicit workshops, these vehicles are well-known for their exotic designs, but for the local Mexicans, they are weapons of an ever-escalating and ever-deadlier inter-cartel war that even the military has been involved in for over ten years. Narco Tanks were first reported around 2010. They have seen prolific use until 2012, mostly in Tamaulipas, by Los Zetas (and sometimes other cartels), and some limited combat with the military has occurred. Los Zetas (The Z’s) has been described as the most technologically advanced, sophisticated, and dangerous drugs cartel operating in Mexico. Perhaps surprisingly, it only began operating as a truly independent organization in 2010, but its roots stretch back the the late 1990s after a group of Mexican army commandos deserted and began working for Cártel del Golfo, one of the oldest cartels in Mexico. It appears as though these commandos formed the core of the Los Zetas contingent, and eventually split from Cártel del Golf – the exact reasons seems unclear, but the conglomerate structure of cartels means that fractures are fairly common. Owing to the fact that their original members belonged to an elite military unit, Grupo Aeromóvil de Fuerzas Especiales (now Cuerpo de Fuerzas Especiales), Los Zetas members tend to be exceptionally well-trained in urban and commando combat. In fact, many of their members are also known to be former US army personnel, Guatemalan ex-special forces, and corrupt officials / police officers. Combining their elite membership with their proven brutality and vast array of military grade weapons, it is clear to see why this group is considered so dangerous. Since 2010, Los Zetas has used Nuevo Laredo, Tamaulipas (north east of Mexico, close to the border with Texas) as its base of operations. Los Zetas are perhaps one of the most brutal cartels operating in Mexico, gaining infamy for events such as the massacre of 300+ civilians in Allende, Coahuila, north East Mexico, simply because two local men betrayed Los Zetas – this being just one of many other high profile incidents. Crucial to understanding the existence of Narco Tanks is that only half of the income of Los Zetas comes from drugs trafficking, whereas the other half comes from activities against civilians and war with other drugs cartels, which has, in turn, created a desire for armored vehicles. Over the last ten years, Mexico has seen high levels of violence due to competition between cartels, each competing for control of drugs routes into the USA. Border areas very useful territory, as they give shorter smuggling trips, which means that there is less time and opportunity for the smugglers to be intercepted by Mexican authorities. Knowing the importance of this to a successful smuggling run, cartels are willing to fight for every single street in border areas. This escalation in fighting, such as the murder of the local-police chief in Nuevo Laredo, has reportedly led to increased military efforts against the cartel. It is even reported (albeit without proper source citation) that there was a decision as early as 2000 by then-President Vicente Fox to send soldiers to fight against the cartels directly, seeing as though local law enforcement lacked the training and raw firepower to deal with the threat. Regardless of the authenticity of this report, it seems that there are some small evidence and reports of soldiers fighting against Los Zetas. This increased fighting has meant that a small arms race has begun between rival cartels, who want strong firepower from vehicles (thus allowing them to perform fast and deadly mobile attacks) and effective protection for their crews during these attacks. As well as this, the role of the military may have meant that cartels have sought to protect their convoys in case of an ambush or quick strike mission. However, it is important to keep in mind a broader context, as more than just an arms race has come as a result of cartel-violence. Conservative estimates give the figure of 70,000 for those killed in cartel-related attacks from 2006-2012, military intervention having greatly exacerbated this. Of course, this intervention was far from uncalled for, as massacres and constant cartel-related violence were on the rise before 2005. Narco Tanks are produced in improvised production lines or underground workshops which are hard to detect by law enforcement, and only two have been reported captured since 2011, the latest being in February 2015. Analysis of captured workshops by the military has shown that some vehicles had suspensions modified to take up to 30 tons of weight which allow the vehicles to feature armor of 5-25mm thick, which can withstand small arms fire and even 40mm military grenades. These vehicles can differ greatly, having been based on SUVs (Sports Utility Vehicles) like the Ford F-350, and even larger vehicles like commercial vans, dumper trucks, and even tractors in rarer instances. Whilst cartels could probably afford military grade vehicles, they are large, conspicuous, and spare parts are not readily available. Whereas, larger civilian and commercial vehicles tend to blend in (as they would attract less attention from authorities, both on the road and during purchase), are easy to maintain, and spare parts are easy to come by. According to an article in Small Wars Journal by Robert J. Bunker, the Narco Tanks can be classified in five categories – I (Defensive), II (Defensive), III – Early (Offensive), III – Mature (Offensive), and IV (Offensive). Level I vehicles are hastily improvised vehicles with minor innovations, an example of such is the use ballistic vests inside a delivery truck to provide protection for cartel hit squads, as seen in one incident on July 11th, 1979, at Dadeland Mall, Florida. Indeed, this precedes the modern Narco Tank, but such vehicles are very likely to exist due to the reduced chance of attracting attention. Level II vehicles tend to be professionally armored SUVs using internal armor kits, ballistic glass, and bullet-proof tires, all of which are common in Mexico. Since the late 1990s, middle-class civilians have begun purchasing these armor kits to protect themselves from kidnapping and general cartel violence. Furthermore, in recent years, these armor kits have become readily available at a low cost for mass consumption, seeing as though the market has grown so large, which means that they are even more common, and have become the most common type of Narco Tank. Level III (early) vehicles have improvised pillboxes or similar firing positions on the bed of a truck, can possibly be armored, and have been seen around northeastern Mexico from 2010-2011. Level III (mature) vehicles make up the bulk of sensationally photographed Narco Tanks (although many examples of Level III Early vehicles exist). 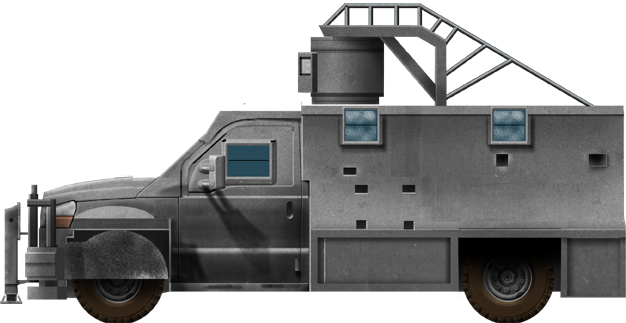 They are usually (but not exclusively) work trucks featuring exterior armor, 5-25mm thick, gun ports, air conditioning for passengers, external gun mounts, battering rams, and even small turrets. The key difference between Level III and Level I-II vehicles it that Level III vehicles are considered offensive weapons, as opposed to defensive. They can be operated like gun-trucks similar to the ones seen employed by the US during the Vietnam War. 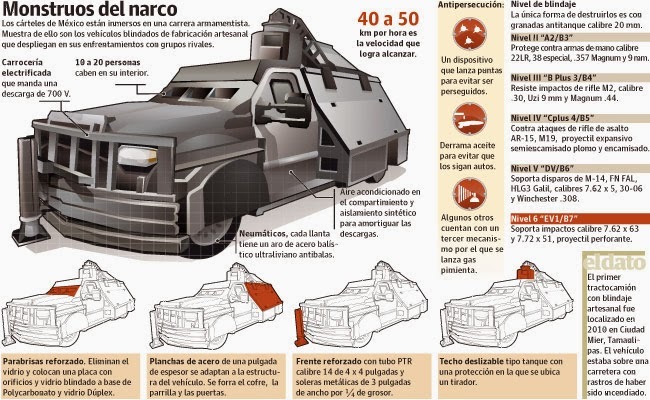 Level III Narco Tanks can be split further into two categories – SUVs and large commercial vehicles. Level IV is a predicted evolution of Level III – an Improvised Armored Fighting Vehicle with an anti-vehicular main gun (probably some form of AA gun) and possibly thicker armor. For various reasons that will be explored later in this article, this evolution has not happened. What makes larger Level III vehicles particularly dangerous and well-known is their sheer size, intimidating appearance, high passenger capacity (often as many as 20 men), and the fact that they may carry heavy machine guns or even RPGs. Analysis of photographs reveals that some weapons seen include personal weapons, mounted .50 cal snipers, mounted machine guns, and perhaps other heavy infantry or anti-tank weapons such as rocket propelled grenades. Unconventional weapons are used on these vehicles, too. Many of them have battering rams, perhaps to burst through gates, enemy vehicles, or even general traffic. Whereas some vehicles even reportedly have gadgets that chuck nails or oil onto the road, presumably to help lose a tailing vehicle. 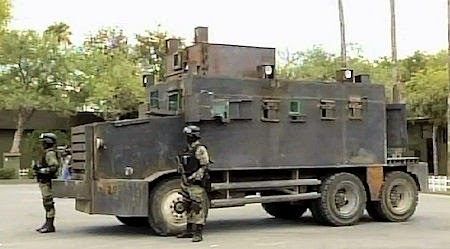 Smaller Narco Tanks are generally based on SUVs and pickup trucks. They are easy to conceal and are known to feature very powerful V10 engines, making them perfect for the type of combat they are involved in. These also often feature turrets, a curious innovation perhaps, but they allow effective fire to be laid down on enemies. For example, one vehicle had a turret designed for a sniper to cover a 160-degree radius towards the front. They can provide crucial forwards fire that most comparable gun trucks lack. 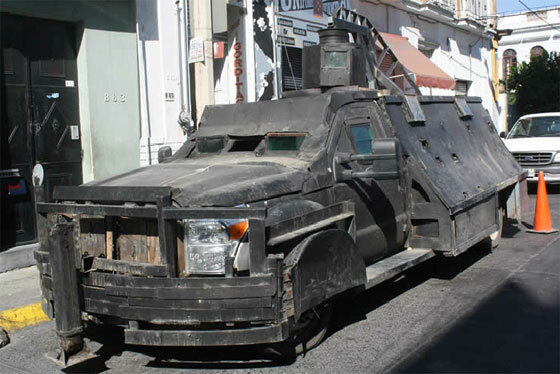 SUV Narco Tanks tend to be light, but there are examples of extensively modified and heavily armed types. Both of these types were made at roughly the same time, but only the lighter SUV Narco Tanks are seen today – the heavy ones tend to be very conspicuous, such as the infamous examples of Monstruo 2010 and 2011 (see below). Such designs are also rather short-lived designs owing to their inherent flaws such as being far too conspicuous, unreliable, and slow. 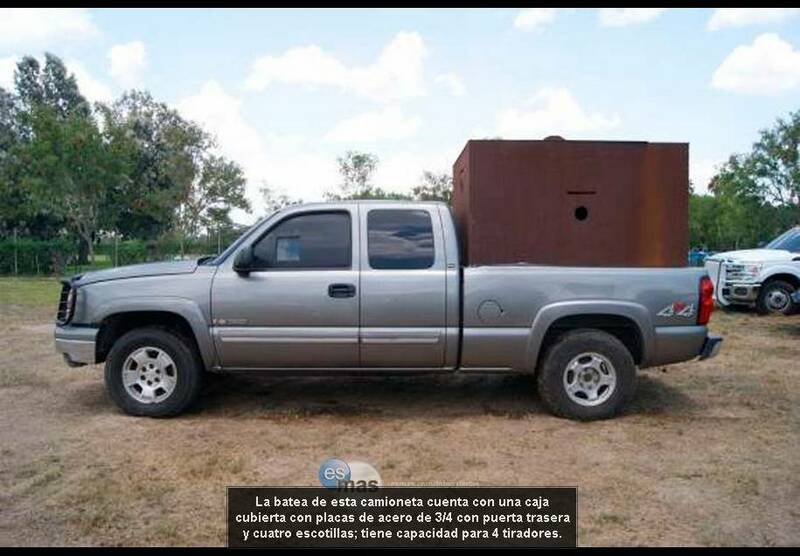 A ‘light’ Narco Tank – a large pick-up truck (possibly a 1999 Chevrolet Silverado 2500) featuring an armored pillbox on the rear. It has space for four passengers, and its armor 19mm thick. It is less likely to attract attention from authorities. Being barely modified, it could probably hit speeds of 110km/h (68mph). Seized June, 2011, Tamaulipas. Lighter SUV Narco Tanks tend to have internal armor kits, or just small pillboxes mounted on the rear. As mentioned earlier, internal armor kits are becoming commercially available, which, whilst providing similar armor characteristics as external improvised armor, are also nearly impossible for authorities to detect from the outside of the vehicle. Vehicles modified with these kits are also not blatantly cartel-related, save for all of the firearms inside, meaning they cannot be seized without serious proof of criminal intent. They are also substantially lighter than those equipped with heavier external armor, which means that these Light Narco Tanks can travel much quicker. These two advantages alone have meant that the chances of seeing the larger, more spectacular Narco Tanks in the future is slim. The smaller vehicles based on SUVs tend to be stealthy and defensive weapons, usually to defend territory or protect drugs shipments. They may still carry heavier weapons such as .50 cal sniper rifles, but rarely anything larger. There are reports of videos that show them to be operated in convoys of 10-20 vehicles, each carrying up to five men. Again, to make the point very clear – this type is more and more common, seeing as though they have many benefits over the larger vehicles, as they are more difficult to detect, can travel faster, and attract less unwanted attention. A Chevy Suburban with a mounted Browning M2 machine gun. Found in Nuevo Laredo, circa 2010. This type of Narco Tank is becoming more common, because it is more stealthy, although the machine gun is very obvious, and it seems as though it would be near impossible to aim. It would also be very dangerous to operate in such an enclosed space without military-grade ear defenders. Larger gun trucks are seen in fewer numbers, perhaps alone or in small groups. 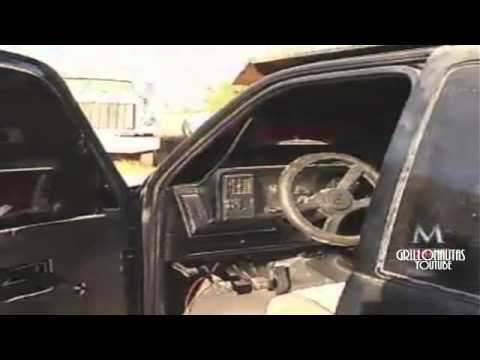 These vehicles seem to be used exclusively as an offensive weapon against rival cartels. However, they feature a major weak point – tires, which are rarely bulletproof and are seldom protected by armor plating. Narco Tanks are far from indestructible and have not overwhelmed opposing cartels or the Mexican military. They are not often engaged by the military, but the military has been known to employ handheld AT weaponry against them, such as the RL-83 Blindicide bazooka, which was used during one engagement in May 2011, at Escobobo, Nuevo Leon. Some photos exist of abandoned Narco Tanks having been severely damaged by RPGs fired from opposing cartels, and some knocked out vehicles have even been graffitied, daring Los Zetas to send more Narco Tanks to their doom. 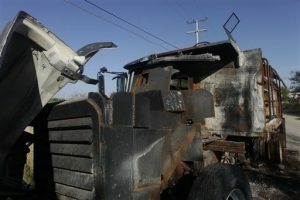 An abandoned Narco Tank based on a truck which appears to have been destroyed by an RPG hit and a subsequent fire. RPGs are common in cartel arsenals, and seemingly with good reason. They have also not been used against civilians as an offensive weapon. 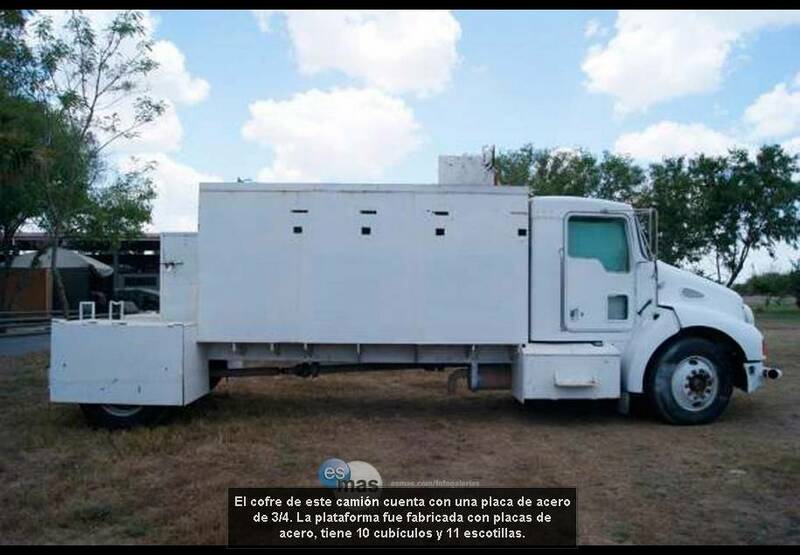 Los Zetas seems to act in a military-fashion, by wearing military uniforms and setting up roadblocks with their Narco Tanks, which sometimes look similar to military vehicles, save for a few details. Despite seeming as though they want to have political and social control over areas, Los Zetas and other cartels are not wholly hierarchical in their structure. In fact, they operate as federations, thus meaning that they can become fragmented very easily (it was fragmentation of one cartel that led to Los Zetas’ formation), thus meaning that they cannot form any kind of governing body. Furthermore, Narco Tanks may become redundant, as the necessary coordination of these military-like vehicles (mainly avoiding capture by authorities) may not be present in a fragmented group. Two of the most famous Narco Tanks are known as Monstruo 2010 and Monstruo 2011. It is unclear whether or not they were made by the same workshop, but they both share very similar features, although it may be the case that they are unrelated vehicles, save for the name. These are the vehicles which truly do look like they were straight from the Max Max franchise, owing to their entirely armored exterior and unique appearance. Monstruo 2010 is the more crude looking version, based on a large SUV. According to the above infographic, it could transport up to 19 or 20 men carrying assault rifles. It features a single turret at the front of the crew compartment for a sniper. All glass was removed from the vehicle and replaced with armor plating; although small vision slits featuring armored glass (polycarbonate and Duplex) were added. The tires, too, were partially covered with a steel plate, but nevertheless, an ultralightweight, bulletproof, ballistic steel ring was added to each. The steel hull was an inch (25.4mm) thick and angled upwards. The front of the vehicle featured a large steel pole 4×4 inches big, to smash through obstacles, and, strangely, the grill was reportedly electrified with up to 700 volts! It also had nail-dropping, oil-slicking, and smoke screen devices which could throw off pursuers, which would be necessary, as it could only travel a mere 40-50km/h (25-31mph). It also featured a satellite communication system for listening to police / military communications – perhaps one of the most inventive and ingenious devices ever attached to a Narco Tank. It would mean that the vehicle would not have to rely on lookouts using mobile phones to inform the Narco Tanks on police / military movements. Crucially, the lookouts could only do this once the authorities were in the process of carrying out a raid, whereas tapping into communication systems would inform the Narco Tank of potential threats before they have even begun moving. Nevertheless, Monstruo 2010 was captured by authorities in Jalisco, May 2011. Monstruo 2011 looked much more sophisticated than Monstruo 2010. The key differences are that it featured two turrets and looked fairly well put together, even featuring reinforced transmission. It is believed that two Monstruo 2011 vehicles have been found, which look almost identical. The first was found in Rancho San Juan, Municipality of Progreso, Coahuila, buried under tonnes of dirt, perhaps to evade detection. 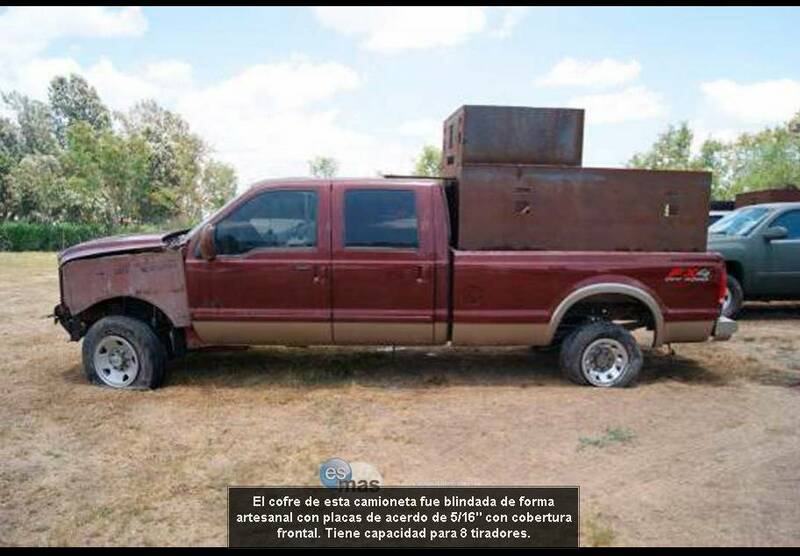 The other was found in Ciudad Mier, Tamaulipas, with its tires missing. A Monstruo 2011 found in Ciudad Mier, Tamaulipas. It is almost identical to the other Monstruo 2011, despite being found in a totally different part of the country. The only obvious differences are the turrets are very slightly different at the top, and the co-driver’s side window is longer. No photos of this one at Ciudad Mier exist of it with its suspension intact. 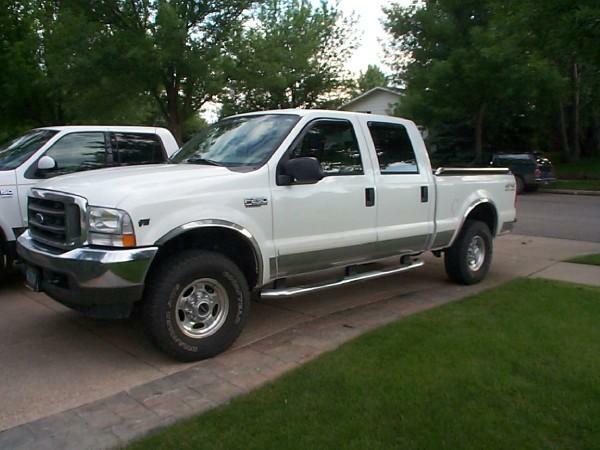 The vehicle is based on a Ford Super Duty pickup truck. On average, its armor is one inch (25.4mm) thick. The driver’s seating area remains totally unchanged inside, save for level V bulletproof glass. The nose of the vehicle was sharply pointed with a steel battering ram, showing a clear intention to smash through obstacles, although it could only travel at speeds of only 40-50km/h (25-31mph). It can transport an estimated 20 people, and it even features semi-enclosed steel firing compartments – six on both sides of the hull, two at the rear, and two sniper’s turrets. It does not seem to feature any gadgets like Monstruo 2010, but it was, undoubtedly, a sophisticated and well-planned design, probably created using blueprints, which would explain the existence of two Monstruo 2011s. 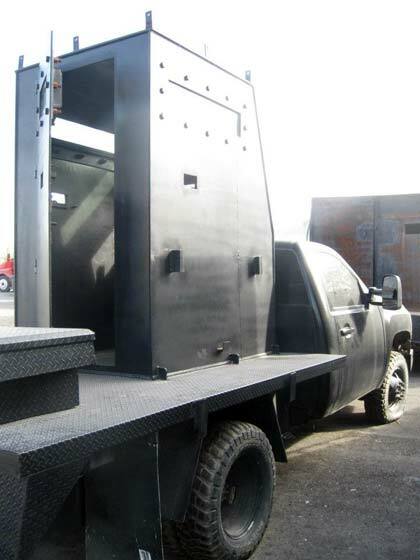 Armament 1x Large steel battering ram. 14x Pistol ports for personal weapons, usually assault rifles and .50cal sniper rifles. Fate Both seized by authorities. First in May, 2011. Second in June, 2011. Probably dismantled or scrapped. 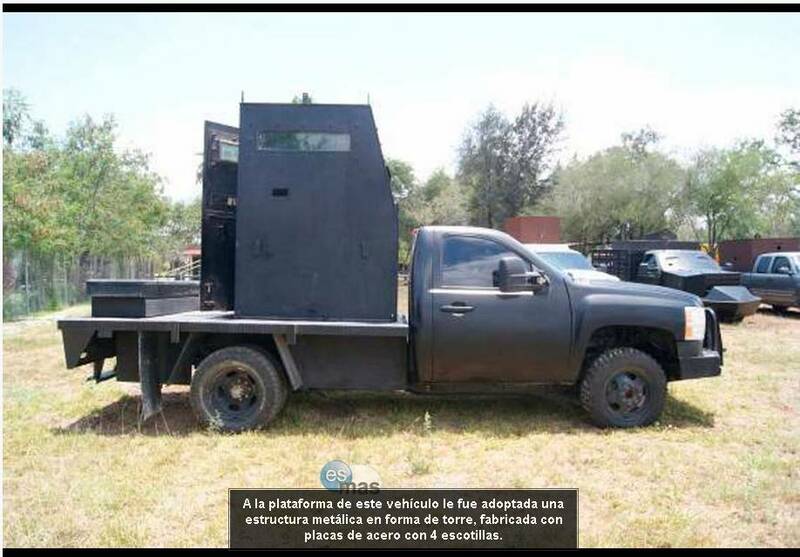 As mentioned earlier, Narco Tanks like the Monstruos and heavy trucks have been seldom seen since 2012, perhaps owing to the fact that stealthy SUVs with internal armor are preferred by the cartels, and with good reason. The Mexican government states that at least 100 Narco Tanks have been seized so far, which has undoubtedly had a knock-on effect on Narco Tank production. Instead of getting bigger, as many commentators have speculated, they have actually gotten smaller and less conspicuous. The most recent reported sighting of Narco Tanks was in February 2015, when a Narco Tanks factory hidden inside a winery was discovered by Mexican authorities near Nuevo Laredo, close to the US border. 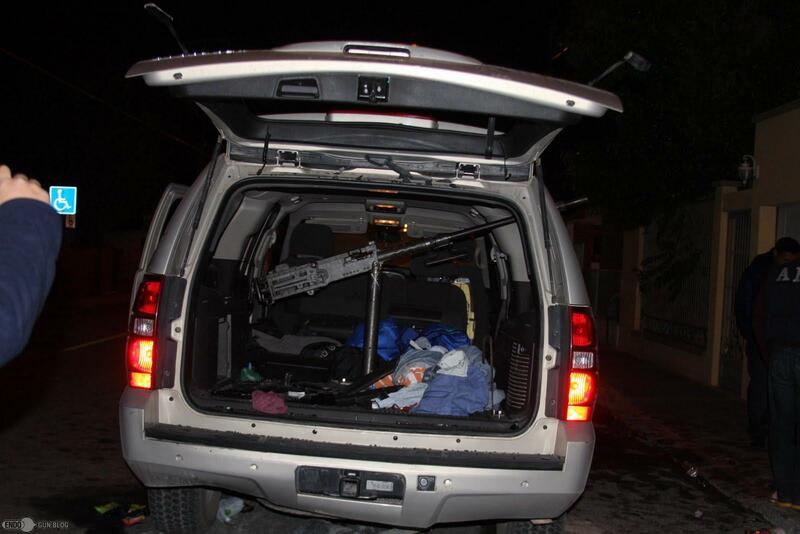 13 vehicles were seized, but only 8 of them were Narco Tanks – the other five were in the process of being armored. Along with the haul of vehicles was a number of .50 cal bullets, bullet-proof glass panels, and AK-47 magazines. This is only the second widely reported raid on a Narco Tank factory, and it is almost certain that plenty more illegal workshops are still in operation and are producing Narco Tanks to this very day. The most famous, and perhaps one of the most heavily armed Narco Tanks, “Monstruo 2010“. 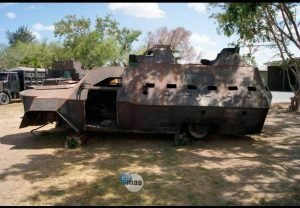 It is believed to be one of the first Narco Tanks ever discovered by authorities. It features a satellite communication device to track police and military communications. It also has smoke-screen, oil-slicking, and nail-dropping devices. It has a heavy steel battering ram on the front, which is also electrified with up to 700 volts! Seized in Jalisco, May 2011. Not to scale. Another famous Narco Tank – “Monstruo 2011“. Two almost identical models of it were built. It features space for 20 men, with individual steel firing stations for each porthole. Its two snipers turrets give all-around cover, and there is a heavy steel battering ram on the front. It is based on a Ford Super Duty. Seized in Ciudad Meir, May 2011. Not to scale. Possibly the largest Narco Tank discovered yet. It belonged to Cártel Del Golfo. The cabin and vehicle platform are all one piece, meaning that the suspension is less likely to snap in the middle. There are no doors for a driver and co-driver, but there is a rear hatch for entry. There are twelve portholes with space for 13 crew members. Seized January 2012, Carmago, Tamaulipas. Not to scale. A .50cal sniper riveted to the rear of a modern Narco Tank based on an enclosed people carrier. This type of Narco Tank is becoming more common because it is more stealthy and its interior armor is a lot less conspicuous. “Popemobile Narco”, so called due to its resemblance to the “Popemobile“. This is a simpler conversion seemingly based on a GMC Sierra 2500 featuring a sniper’s cabin on the rear with space for four people. Despite the crude construction, the materials used in its construction are high-quality steel and bulletproof glass. One of the more exotic looking Narcos Tanks featuring a turret. It is named “Monstruo 2010”, it is perhaps an early version of “Monstruo 2011”, although they are more than likely unrelated designs. Seized in Jalisco, May 2011. The interior of one of Monstruo 2011’s turrets. It seems as though the viewports featured shutters. A ‘light’ Narco Tank, but still one of the larger pickup trucks (seemingly a 1999 Ford F-150 FX4 double-cab) featuring an armored pillbox on the rear. It has space for eight passengers and gives frontal coverage. The hood of the vehicle is reinforced with hand-cut steel plates, probably 19mm in thickness. Seized June 2011, Tamaulipas. One of the larger pickup trucks featuring an armored pillbox on the rear. It has space for eight passengers and gives frontal coverage. Seized June 2011, Tamaulipas. A large white truck with plenty of additional armor – the hood is 19mm thick. It has the rear wheels covered up, but the front ones remain exposed. There are ten portholes and eleven separate firing stations. Seized June 2011, Tamaulipas. 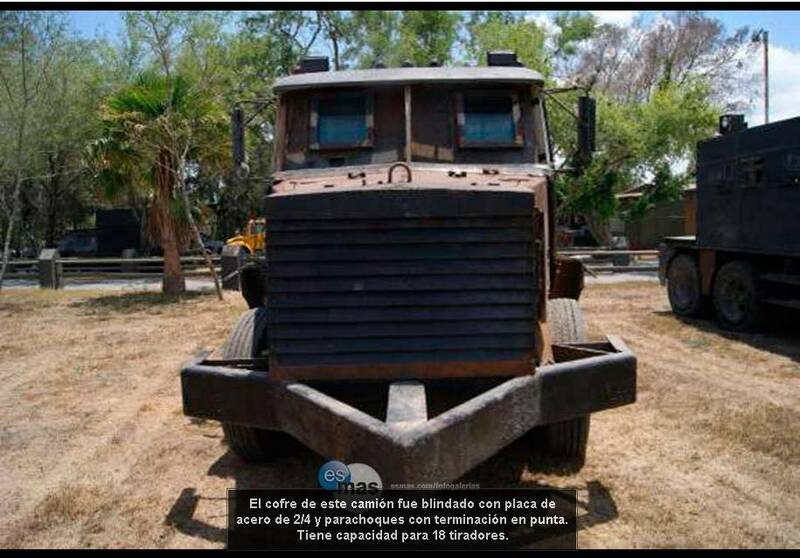 One of the larger Narco Tanks, it might be based on a dump truck, and it supposedly belonged to Cártel Del Golfo. Mexican Marines are guarding the vehicle. 25mm shells, a 40mm grenade, and some AP .50cal rounds were also reportedly found inside! The interior of the above (or possibly below, sources differ) Narco Tank. 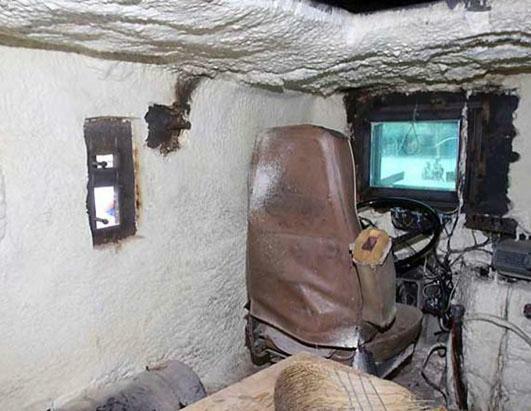 It features air conditioning, and possibly fire-proof insulation. 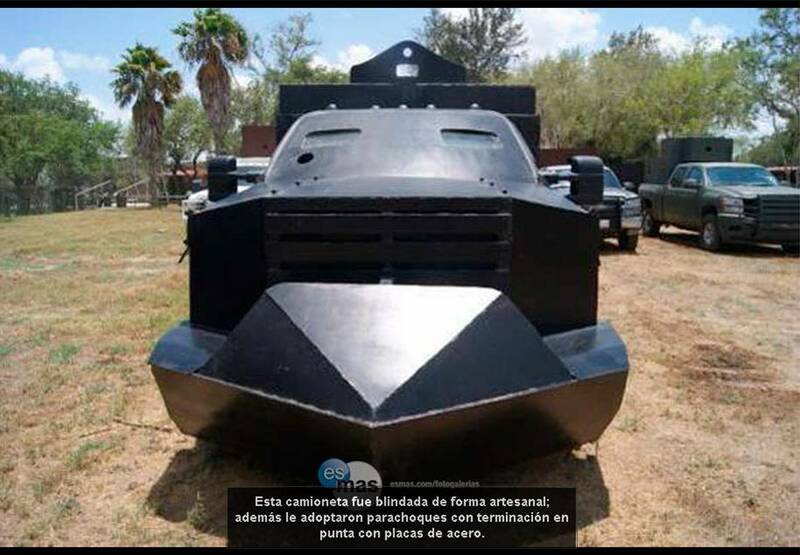 A heavily armored Narco Tank nicknamed “Batmobile”, seized January 2012, Carmago, Tamaulipas. It has space for 18 passengers. It features a ram, and the hood is covered with 12.7mm inch steel. Also believed to be a Dodge truck (based on interior photos of the steering wheel) it supposedly belonged to Cártel del Golfo. 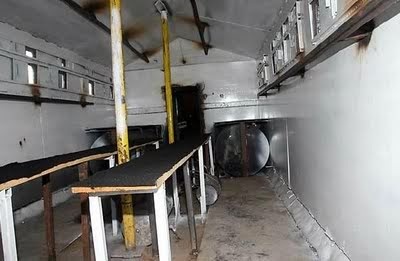 Interior of the above Narco Tank (or possibly the other above truck, sources differ). 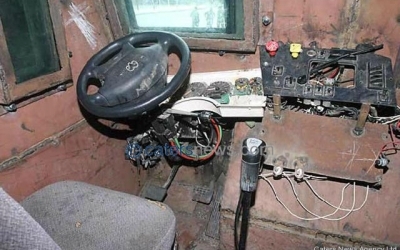 All the electronics have been rewired into the newly armored driver’s position. 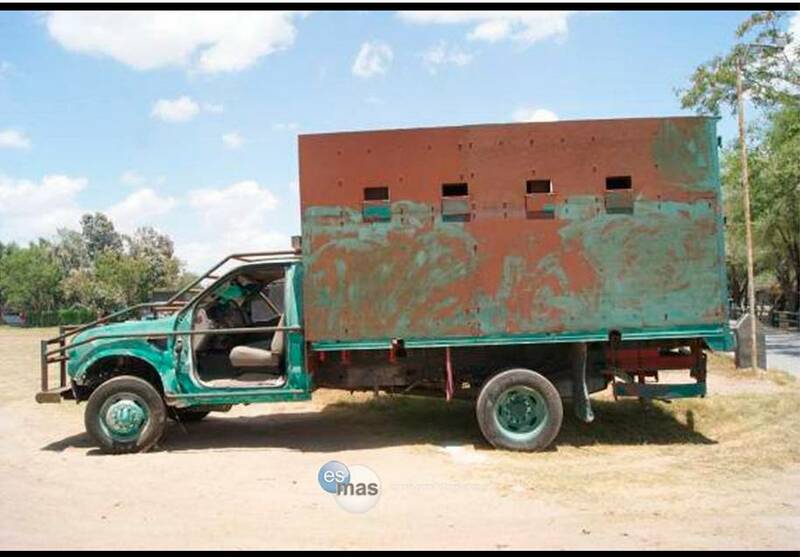 Another view of the heavily armored truck featuring a ram, seized January 2012, Carmago, Tamaulipas. 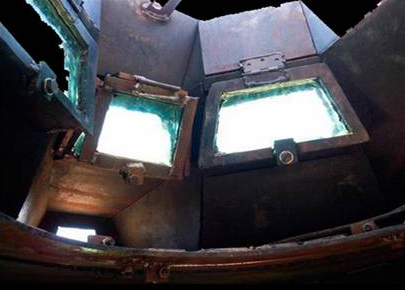 Interior of the above Narco Tank. Despite its crude-looks, this is one of the more ‘polished’ interiors, featuring benches for crews to sit on and large firing ports. 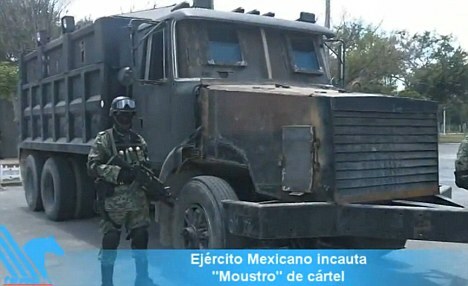 A similar heavily armored truck featuring a ram, seized January 2012, Carmago, Tamaulipas. The front ram has been reinforced with steel plates. A video of one of the Monstruo 2011s having been seized (Spanish). A video of Monstruo 2010 having been seized. That looks very good! Although, maybe the axles are kinda badly done. Everything else seems to be on point though! thanks for the feedback,,, i will try to make it better! The one with the Dodge steering wheel… is not based on a Dodge truck. The steering wheel may have come from a Dodge, but that has a Bendix or Wabco MV3 valve to release air brakes and an Eaton-Fuller twin countershaft transmission – both of those are exclusively the domain of heavy duty trucks, and Dodge hasn’t been in that market since the late 1970s. They probably used the Dodge steering wheel for the sake of space.. if you have an adequate power steering system, there isn’t any real need for a large steering wheel. Judging by the column used for the shifter, that is most likely a Freightliner truck. If i were to build a narco tank i would start with a Ford F-150 Raptor, and cut out the rear panel separating the cab from the bed. I would then saw a beatle in half attaching the rear half to the now open space. 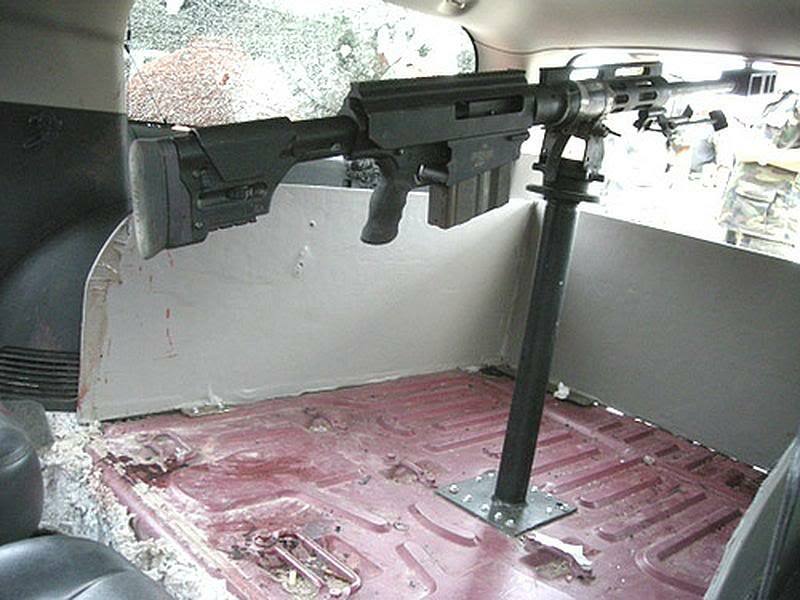 This would make somewhat of a gun point, as i would attach a .50 cal pointing out of its window. This would also enable bullets to bounce of do to the shape of the beatle. I would also attach a extra bed and rear suspension making it a 6 wheeled beast. The extra bed could serve as a area for normal bed things, or as cover from hostile fire. To increase ramming power i would attach a bull bar to the front, protecting the engine and pushing debris away from the tank. The left side front windshield would be removed, a metal plate with a pistol port in it replacing it. The drivers side door window would be replace with another metal plate also with a pistol port. The rear windows would be removed again replaced with plates. The entire body would be reinforced save for the beatle part to retain bullet deflection. That would have internal armor. I would probably replace the engine with a much heavier pulling V12 able to support all of the added weight. This would enable the vehicle to serve as a tank as well as being able to go at a decent speed. Fell free to submit one such article, whe already have an impressive photo database collected since the beginning of the conflict to go with it !